iradiophilly | News - 2 Killed in Private Jet Crash in New Jersey; Four Frat Member Plead Guilty; Primary Elections Tues.
2 Killed in Private Jet Crash in New Jersey; Four Frat Member Plead Guilty; Primary Elections Tues.
Two people were killed after a private jet from Philadelphia crashed near an airport in North Jersey. The Learjet 35 took off from Philadelphia International Airport at 3:04 p.m. Monday. 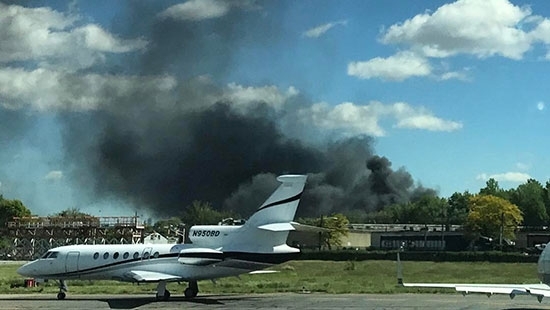 The FAA reports that the plane crashed on approach to Teterboro Airport in Bergen County, NJ at 3:30 p.m. about a half mile from the airport. It landed in an industrial area and damaged a warehouse near Kero Road and Commerce Road in Carlstadt, NJ. Emergency crews responded to extinguish the heavy flames and smoke. There were no passengers on the plane at the time, just the pilot and co-pilot. No one on the ground was injured. Teterboro Airport was closed but departing flights have resumed. The FAA is investigating. Four former fraternity members pled guilty Monday to charges related to the death of a Baruch College student during a hazing ritual in a rented Poconos mountain home in 2013. Kenny Kwan, Charles Lai, Raymond Lam and Sheldon Wong pleaded guilty to felony voluntary manslaughter and hindering apprehension charges in the death of 19-year-old Chun "Michael" Deng. They were originally charged with third-degree murder. They face 22 to 36 months in prison when sentenced in December. The Pi Delta Psi fraternity at Baruch College in Manhattan had rented a home in Monroe County, Pennsylvania for the weekend. Deng suffered a major brain trauma after participating in a hazing ritual known as 'the gauntlet.' He had to don a blindfold and wear a weighted bag and run the gauntlet while being repeatedly pushed, shoved and knocked down. Several other former members of the fraternity face less serious charges.